A Camp Pendleton Marine, who went missing days before he was scheduled to report for duty, is now the subject of a missing person investigation in San Diego County. 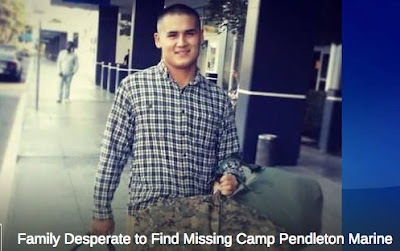 Lance Corporal John Hair was last seen at the Oceanside Transit Station on Oct. 7 after returning from a two-week leave to visit his mother in Fresno, California. Security cameras at the station captured him at train stations in Los Angeles and Oceanside but his whereabouts after are unknown. Hair's family told NBC 7 they are worried something may have happened to him. “Every time I have talked to him, every time I have texted him or called him, even if he didn't answer right away, he answered eventually,” his sister Melissa Hair said.